Trying to work out what to eat in Japan? It can be a challenge for the visitor, so many options and usually not enough days. 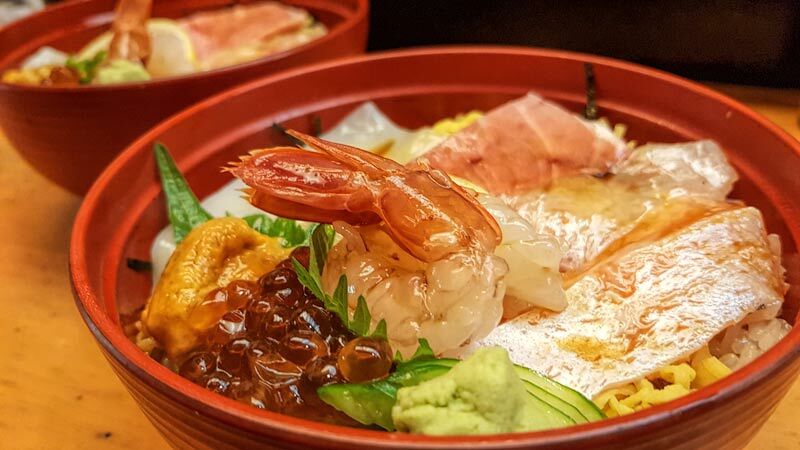 These are 20 of our top picks of the best Japanese food to add to your list. Food and travel are so tightly intertwined that it’s hard to separate them. Our food memories are such a major part of our travel experience that I’ll often attempt to recreate a dish or flavor profile at home for friends and family so we can relive a special experience from our journeys. Which of these top 20 are you familiar with and if you had to pick only one, what would it be? It’s been no secret that we’ve made so many so many visits back to Japan with food at the forefront of our mind, and we clearly aren’t the only ones who have a deep passion for the Japanese cuisine. In 2013 Washoku, traditional Japanese food, was added to the UNESCO Intangible Cultural Heritage List. Washoku literally translated means Japanese (wa) food (shoku) but “wa” can also be translated as harmony which is a core concept in Japanese cuisine. Each element of the dish must be able to stand alone as an individual ingredient and fit harmoniously with the overall dish. The first food to come to mind for most people when you mention Japan is sushi. It comes in many forms but in essence it involves cold rice flavoured with vinegar and embellished with seafood, vegetables or egg. In the West we’re most familiar with makizushi, a rolled form of sushi often covered in nori, a sheet of seaweed and filled with a variety of fillings. While traditionally the fish was raw and most often still is, some variations do use seared or cooked meat and seafood. 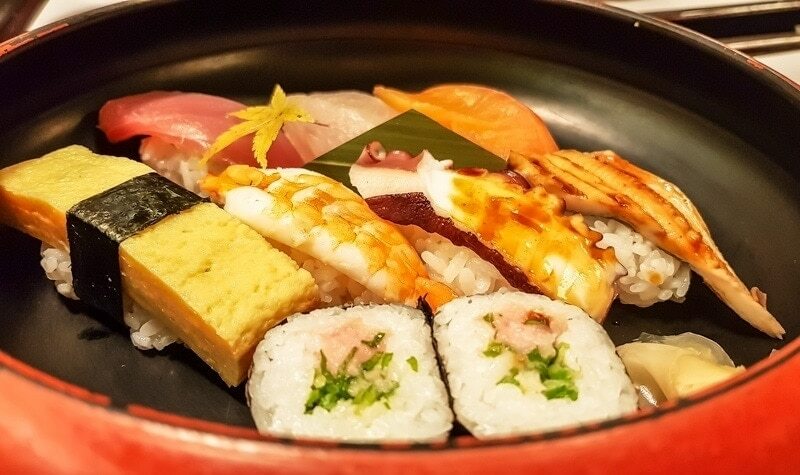 Sushi in Japan generally follows the tradition of each ingredient standing alone and in harmony with the dish, therefore they often feature a single ingredient as the topping. This style is typical of nigiri sushi where the rice is shaped by hand, a smear of wasabi added and a perfectly cut slice of sashimi placed on top. This is the best of the best in my opinion. Served at home the most common form is temaki or hand rolls where a rectangle of nori is spread with rice, loaded with fillings and rolled into a cone shape. Often family members may add their own favourite filling and roll them up. For lunch boxes, lunch on the go and convenience store snacks onigiri are another popular form. The rice is formed into a triangle by hand and a small amount of filling sealed into the centre. It’s also often wrapped with nori just before eating and convenience store options have interesting bags that keep the rice and seaweed separated until you are ready to eat them so it doesn’t soften. I saw these wrappers for sale in Daiso once and wish I’d stocked up for use at home, they make the perfect picnic food. You can learn to make your own sushi while in Japan at one of the many specialised cooking classes. This one in Tokyo includes Tsukiji market, sushi making lesson and lunch or this sushi class in Nara would combine with some of the local attractions to make a great day trip out of Kyoto or Osaka. Sashimi is a bite sized portion of raw fish. When prepared by an expert chef they are cut from the perfectly fresh fish taking account of the grain and other factors to cut it in the perfect size and angle. It is served without rice but usually with wasabi and soy sauce along side. 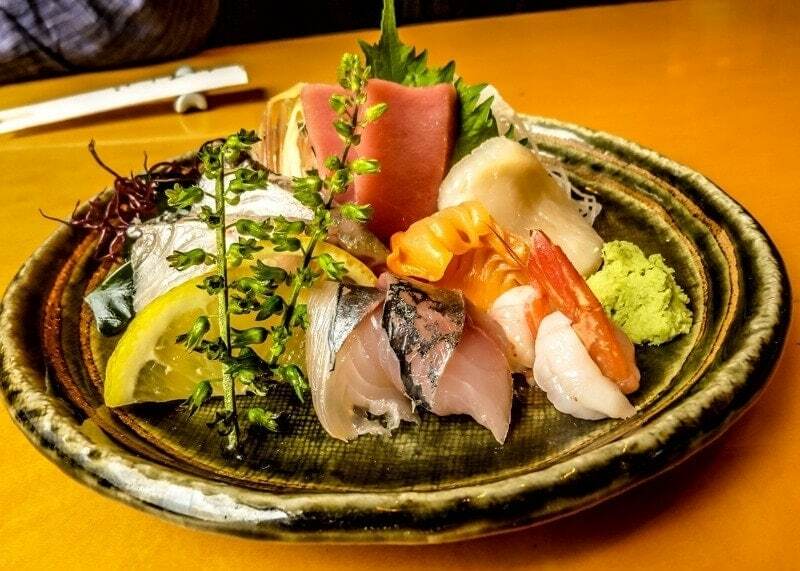 When you select sashimi, or any dish involving raw fish you need to consider that the ingredients must be incredibly fresh and good food hygiene have been observed throughout its handling. While I’ve eaten a lot of raw seafood all across Japan and never once had an issue I do find the major fish markets and surrounding restaurants are a good choice for this reason. We’ve had wonderful sashimi near Tsukiji in Tokyo, in Kuromon market in Osaka and from Omicho in Kanazawa amongst others. Ramen is dish of noodles in soup with a selection of toppings. While it originated in China rather than Japan it has been thoroughly absorbed into the local food culture. You can buy it all around the country quite literally from Mitchelin starred restaurants, ticket vending machines at hole in the wall counter restaurants and as cup noodles from the convenience store. Each region puts its own twist on it too with variations to the broth, noodles and toppings. Sapporo style is one of my faves, being a cold climate its lusciously enriched with Hokkaido butter and a rich chunk of pork. 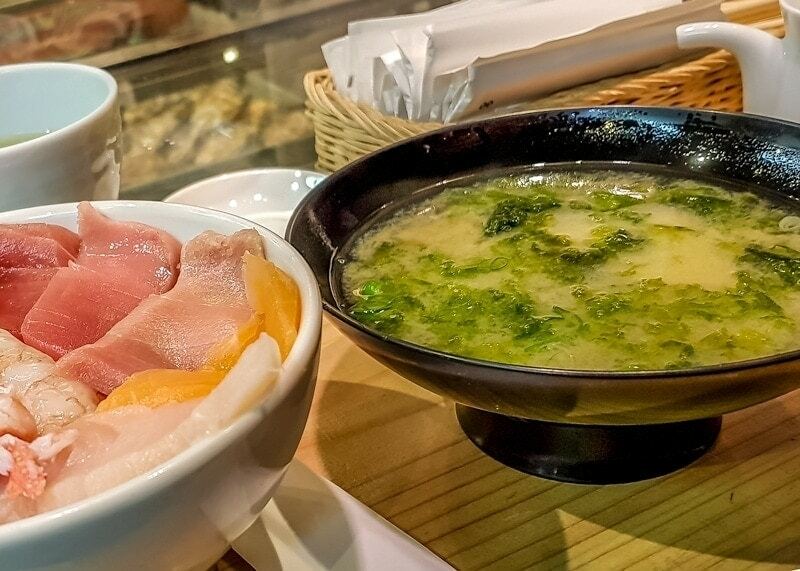 If your travel budget is feeling the pinch then ramen can be a great ally, there are so many styles, variations and places to try it and almost always at a very reasonable price for a very filling meal. It’s hearty and warming making it a great choice especially from autumn through to spring. 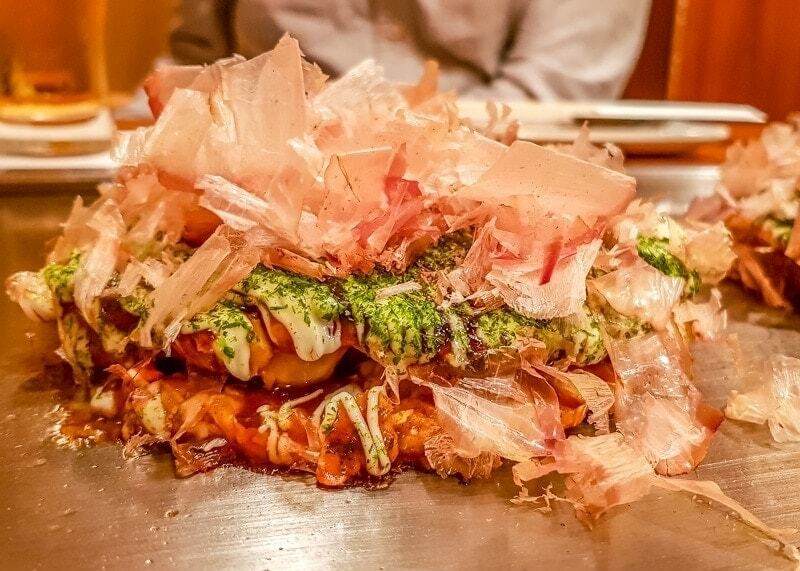 I couldn’t make this list without including okonomiyaki although it’s so difficult to describe it in an appetizing way to someone who hasn’t eaten it before. 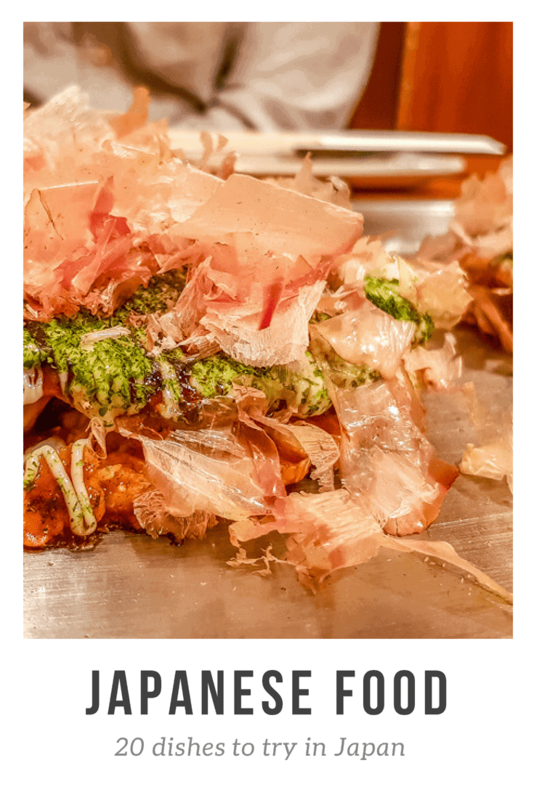 I’ve heard it described as a pizza (but it’s nothing like pizza) or a pancake (but batter is a very small part of okonomiyaki) neither option would really help you understand it. A savory grilled fritter containing mostly cabbage together with egg and flour to form a light batter then topped with all sorts of cooked additions such as pork and seafood, sauces and bonito flakes. The trouble is all that talk of cabbage is going to put a lot of people off and it taste DELICIOUS and nothing like cabbage. I highly recommend trying one to see for yourself. Okonomiyaki comes in at least 3 forms that I’ve encountered. Osaka style is my favorite and pretty much as described above with so many variations, find a nice izakaya style bar where they have the grills in front of you and try it along side a new Japanese beer is my recommendation. Hiroshima style is made with the addition of noodles into the patty, it’s delicious but I find the additional carb makes it too filling for me. The third variation is from Tokyo where they call it monjayaki, with this version you cook the toppings first make a ring with them and add the very liquidy batter to the middle then mix it up to form a softer version of the fritter. For me it’s Osaka for the win but worth trying the various versions to make an informed choice. 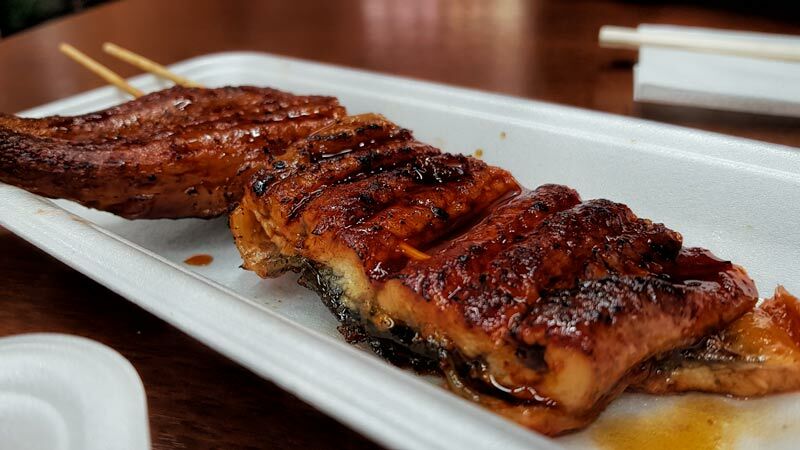 A traditional dish I didn’t expect to like as much as I do was unagi no kabayaki which is a fresh water eel cooked on a grill and basted with a soy based sauce. When you try it you will want to find somewhere that grills it fresh, this give the best flavor and texture. Sometimes smaller restaurants reheat it to serve on a donbori style dish and while it can still be nice it is SO much better straight off the grill. We had some recently in Kuromon market in Osaka, I’ve included the directions in that article if you want to try the exact place but it really was special and as a market stall very affordable for the quality. I try to make sure we try new places on each trip but I will be dragging Drew back there next time we’re in the city. 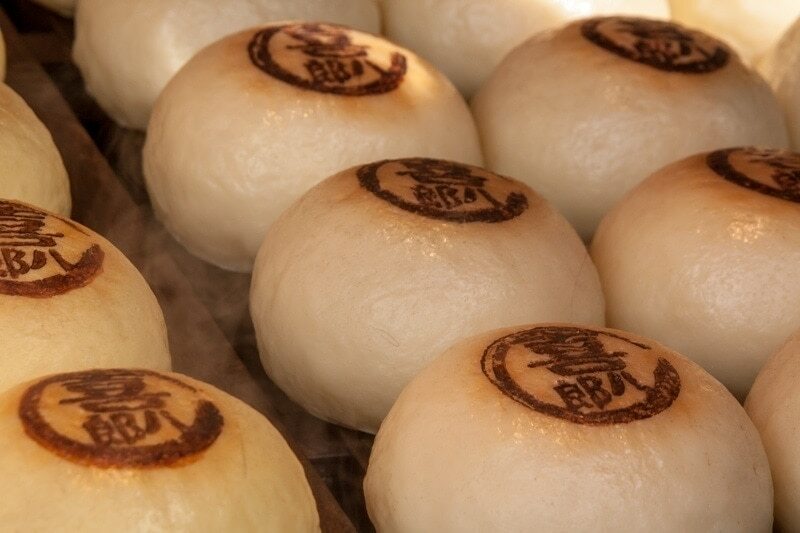 These are steamed meat buns or dumplings and based very closely on the Chinese baozi. They are made from a flour based bread dough filled with a variety of meats including beef and pork. 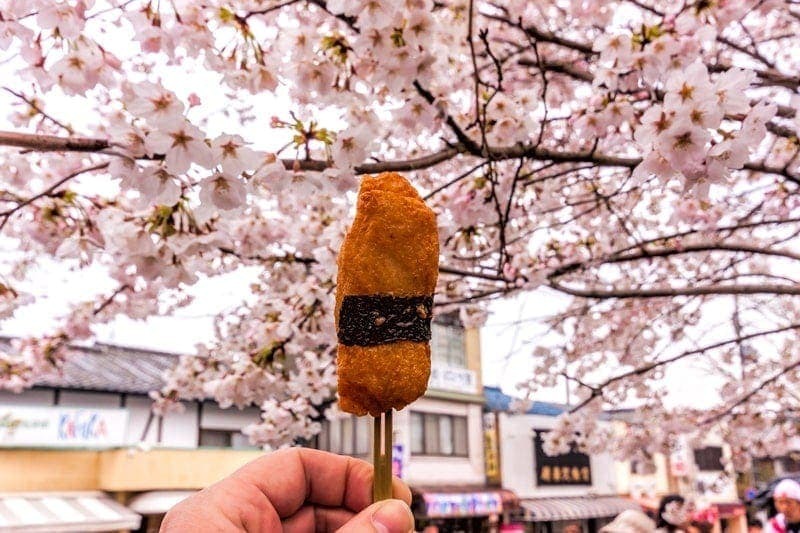 These ones are filled with a spicy beer mix and were a warm snack in the Higashiyama district in Kyoto, great motivation for walking up and down those hills. Fish and seafood are very popular in Japan and you will find them included in this style of buns too. I’ve had them in many different forms including colored black with squid ink or stuffed with hairy crab in Hakodate. While in Japan I’ve probably had more miso soup than any other dish. That’s because it is so often served as part of a teishoku, a Japanese set menu or a traditional menu that you will often experience in a ryokan accommodation. Miso is a seasoning made by fermenting soybeans and adding salt and other ingredients. It’s used in many dishes but Miso soup, a simple broth with a few additions is a form that many Japanese eat every day and can be part of any meal. Common additions to the soup include spring onions, tofu, seaweed and mushrooms. Fermented foods such as miso are now known to be very good for us, including our digestive and immune systems but they have been favored in the Japanese diet for centuries. I’m not a fan of all fermented food but I do love the flavour of white and red miso. 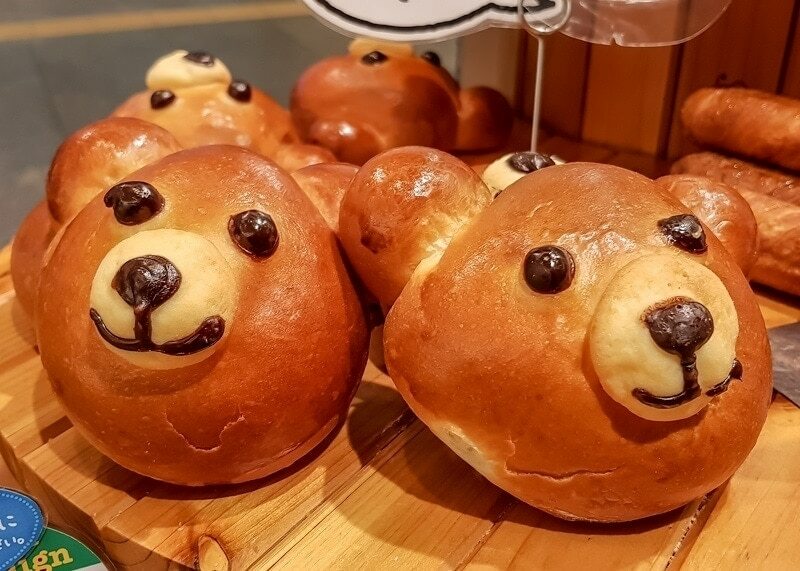 ‘Kawaii’ is Japanese for cute and kawaii food comes in all forms and flavours. From unicorn coloured giant fairy floss sculptures to bento box creations shaped like a favourite Pokemon character and animal shaped baked goods you will see it in Japan. While I’m not a fan of the themed food cafes and popups, they are generally overpriced for lack lustre dishes, there are many options that are just too cute not to try one of two. Dominique Ansells bakery in Omotosando just up the road from Harajuku is on my list next time I’m there in cooler weather for the spectacle of a marshmallow flower blooming in a rich warming cup of hot chocolate. These little batter balls with an octopus centre are just so good. They are available in many places especially during festivals and seasonal events but they always remind me of Osaka which is the best place to head off on a takoyaki tasting spree (yes I MIGHT have done that). They are best eaten as a snack or light meal and I’ll admit they aren’t on the healthy options list but they are very good as a treat. Creating the perfect takoyaki on the grill has become something of an art form with some serious debate on what makes the perfect takoyaki. In Namba you can even eat it from a takoyaki shop mentioned in a Mitchelin guide such as Aizuya but I’m going to be a bit controversial and suggest that may not necessarily be the best in the city. Now there’s nothing wrong with them but they have gone a bit new-age fusion with versions in soup, with beef and cheese fillings and without sauce or horror of horrors, no dancing bonito flakes. 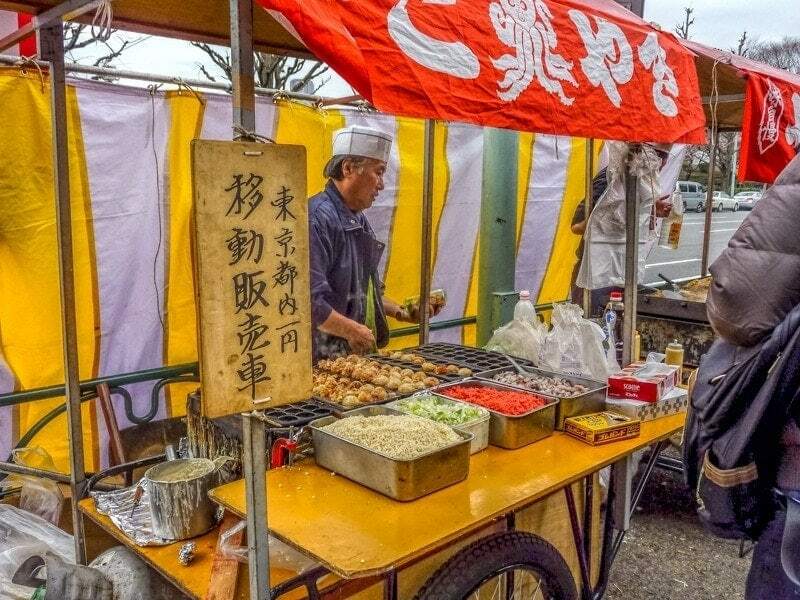 To me it will never be takoyaki without the tako (octopus) and I’d highly recommend picking out a local mom and pop stall with a bit of a queue for your first tasting. Beer and takoyaki is a bit of a classic with the Osaka locals so it’s hard to go wrong when you eat where the locals are eating. 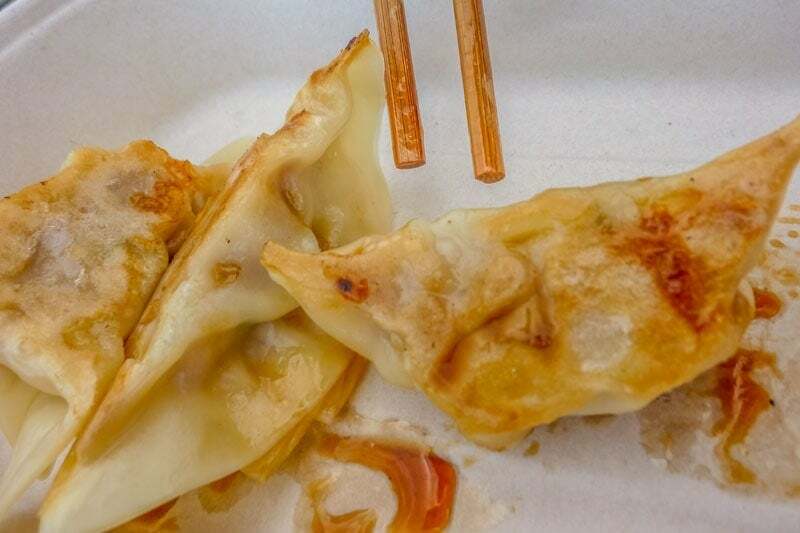 Gyoza are a form of dumpling that may be steamed or fried on one side and then steamed in the same way as the Chinese ‘pot stickers’ that they are based on. The most typical filling is pork and spring onion but other varieties are now available in many places. They are commonly served at ramen restaurants and anywhere that street or festival food is sold. They are made by encasing the filling in a thin round dumpling wrapper then folding and crimping it to seal before cooking. Udon noodles are delicious and suited to eating all year round with them served hot in cooler weather and cold in the summertime. The Omen restaurants in Kyoto are a noodle restaurant we been back to a few times, the quality is good, prices reasonable and their seasonal menu means you get to try a variety of dishes so there is always something new. 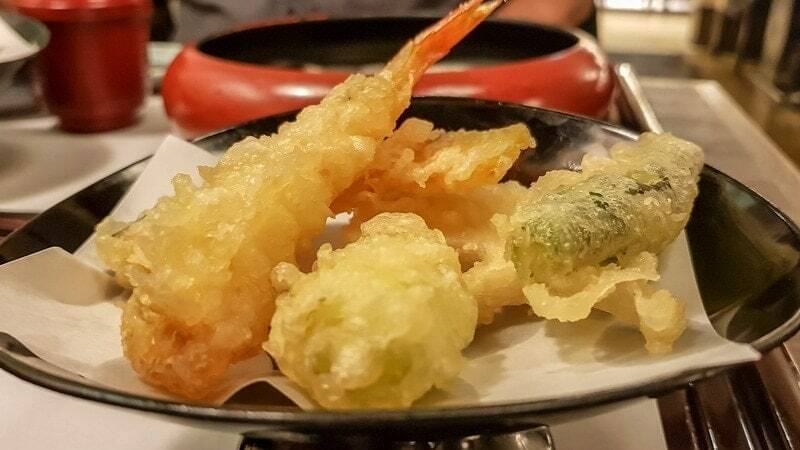 Tempura is battered and fried fish and vegetables. The batter is extremely light and crispy resulting in the produce beneath it retaining its crunch, texture and quality. 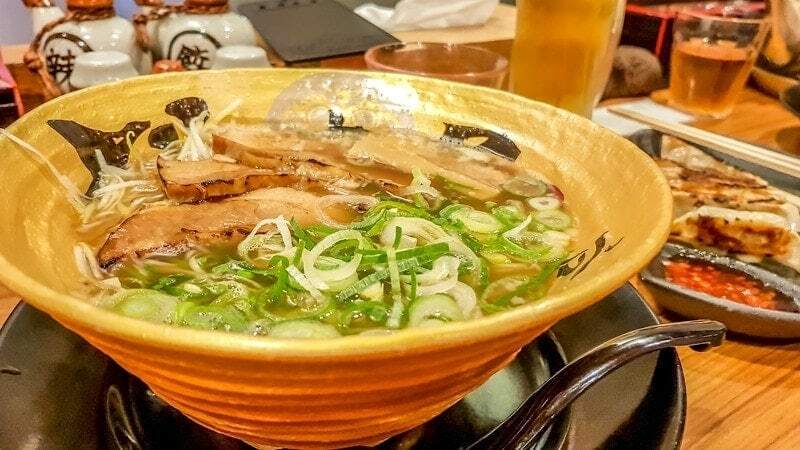 It’s a dish that dates back to the mid 16th century in Japan and is a food style you will find all across Japan today from high end restaurants to a topping for a bowl of ramen. Kushiage is most often seen as single skewers eaten as a street or festival snack but in Osaka where it originated we noticed there are restaurants that specialise in it. Kushiage is a Japanese dish of meat, seafood or vegetable skewered on a stick, breaded and deep fried. Some restaurants cook the skewers and serve them, others have a deep fryer built into the table so they can be cooked as you are ready to eat them. They are served with dipping sauce and cabbage. With the dipping sauce do not double dip, these are often communal sauce containers that are reused between tables. If you want more sauce use the pieces of cabbage as a scoop to take more sauce to pour onto the skewer on your plate. I’m told the cabbage serves a double purpose as eating it will stop the fried food sitting heavily in your stomach at the end of the evening. I’m not sure on the idea of eating fried food as a complete meal myself but a skewer snack can be tasty. 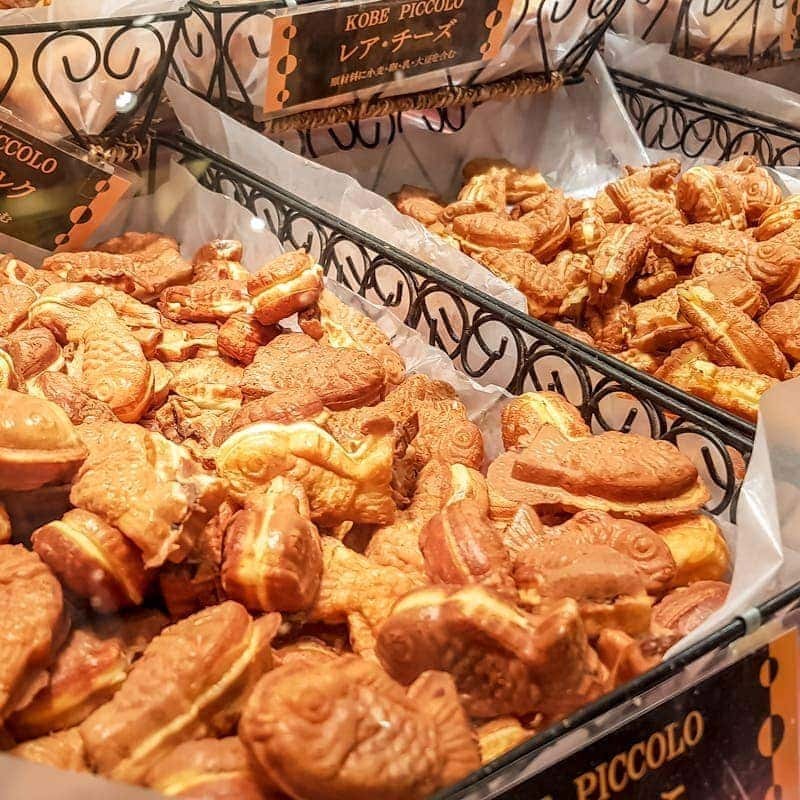 You will quickly notice that the Japanese, especially the young, are fascinated with French cakes and pastries and there are bakeries, cakes shops and dedicated counters in department store food halls with all manner of visually perfect a treats inspired by a Parisian pastry shop. 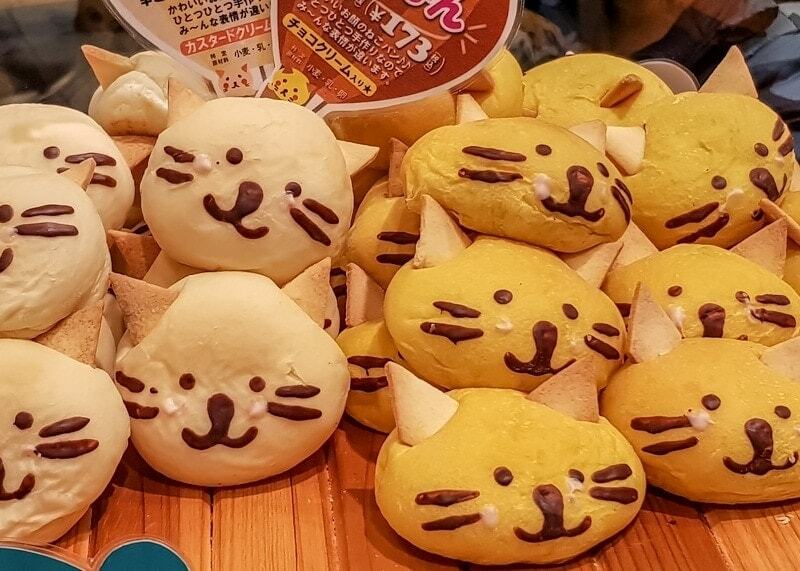 Japan has evolved their own versions of these cakes and desserts to suit local preferences, they are generally lighter and less sweet than a typical French treat but there are some beautiful and delicious options. Shu cream are cream puffs (choux pastry) filled with a custard or pastry cream. The cream filling is smooth and silky and often flavored. Matcha ispopular but my seasonal favourite is sakura. While ‘cherry blossom’ is often more like strawberry or cherry it’s not too sweet and tends to avoid that artificial taste that can often be present in colored and flavored sweets. My top suggestion to try these if you are around in March or April is at Kyōami on the walk up to Kiyomizudera temple where you can smell them baking and see them coming out on enormous trays fresh from the oven. The ones in the photo are flavored slightly with cinnamon I believe which accounts for the darker color, they are particularly good with a super smooth and creamy custard inside. I’m happy to walk a good distance to detour past here for a morning treat. Kyōami is at 605-0862 Kyoto Prefecture, Kyoto. 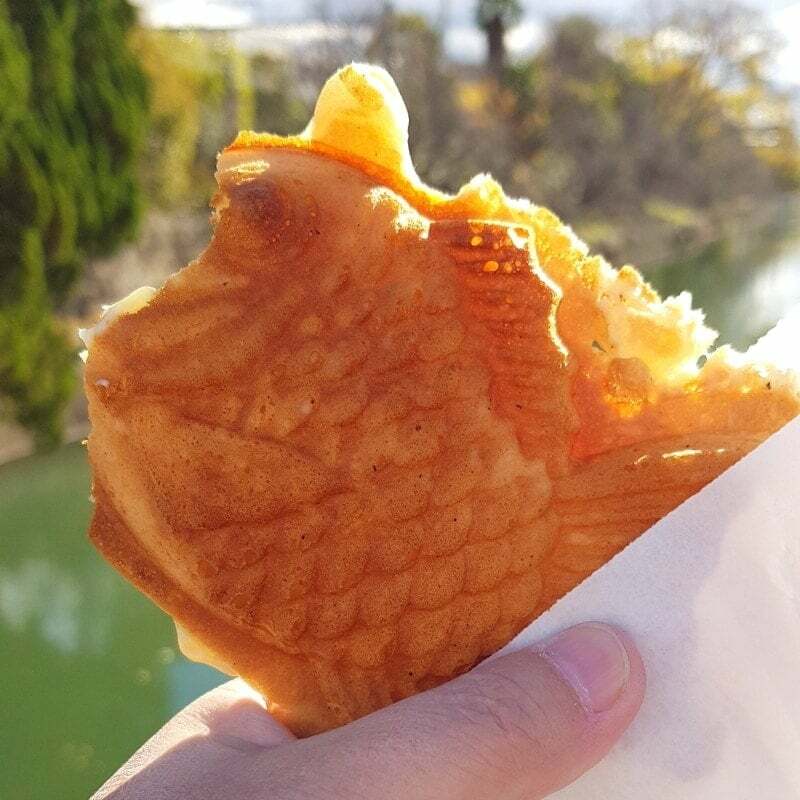 This a more modern Japanese sweet snack, it translates as grilled snapper but it is like a pancake cooked in a special tool on the grill that’s shaped like a snapper fish and allows the batter to cook with a filling added. Sweet red been paste is the most popular filling and often they will have custard as an option too. 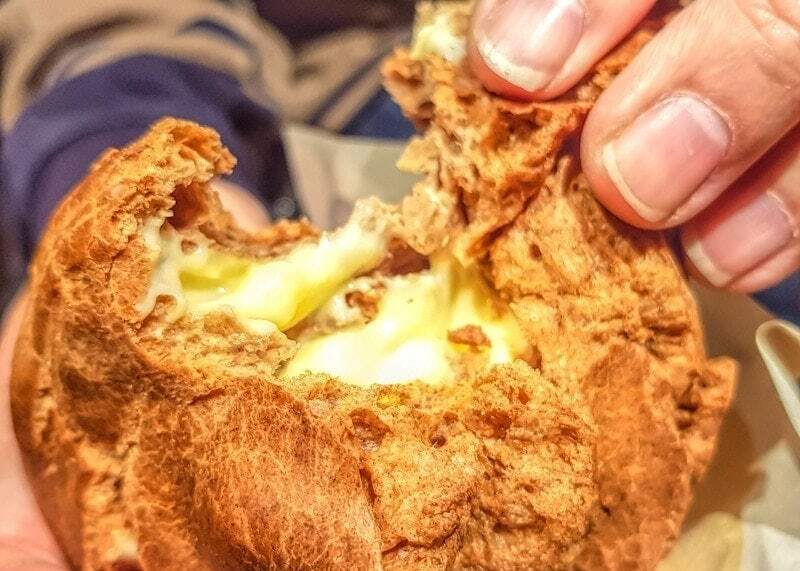 You’ll usually find these at festivals and other events that have street food or the ‘shopping streets’ that lead up to major attractions like Sensoji temple in Tokyo, you’ll find all sorts of filling options available at that one. They are extra yummy warm from the grill and I find them hard to resist as you can tell from this photo taken on the walk up to Fushimi Inari shrine in the south of Kyoto. I knew I wanted a photo but I’d still bitten the poor things head off by the time I got my camera out, oops. Mochi is made of pounded glutenous rice. It’s often served as a sweet dish, traditionally with sweetened red been paste or more modern adaptations with a variety of fruit fillings are common from the markets and sweet shops. 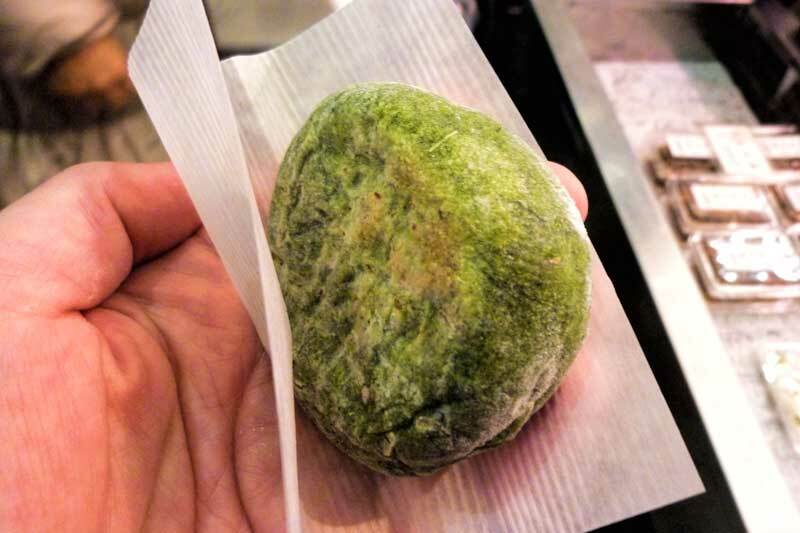 I’ve also tried a couple of special spring versions, a traditional one flavoured with mugwort called kusa mochi from Nishiki market in Kyoto, toasted fresh over a coal grill it’s slightly crisped on the outside and goey in the centre. A soft lighter version was pink and sakura flavored, it was also purchased in Kyoto on the walk up to Kiyomizudera temple. In Hakodate in northern Japan I was fortunate enough to be invited to a party where mochi was prepared fresh in front of us, I even had the chance to participate for a while in the rhythmic pounding of the rice, a particularly brave gesture by the team given my lack of rhythm and that they turn it with bare hands between each strike. 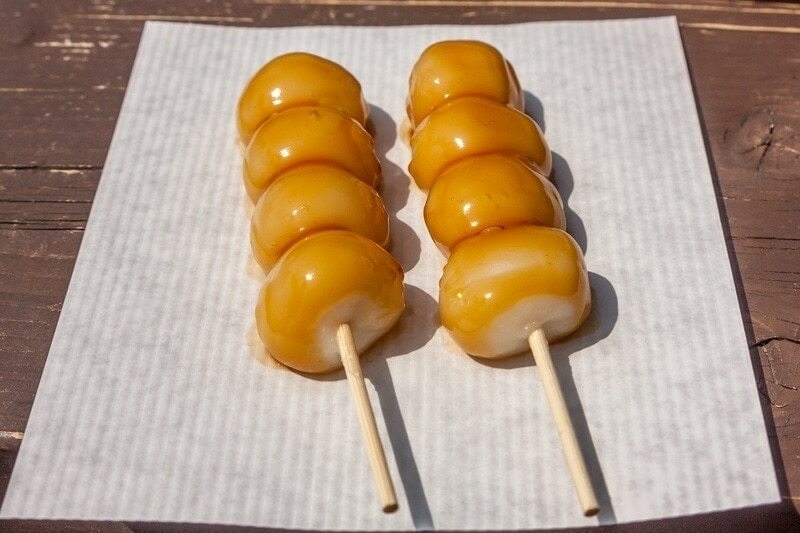 Dango are sweet dumplings made from mochiko, a slightly heavier version of mochi. They are usually served on a skewer and grilled but come in many different forms, often associated with different seasons. Two common forms you will see are a three colour version with a pink, white and green dumpling and this version topped with a sticky sweet soy based sauce which is my personal fave. 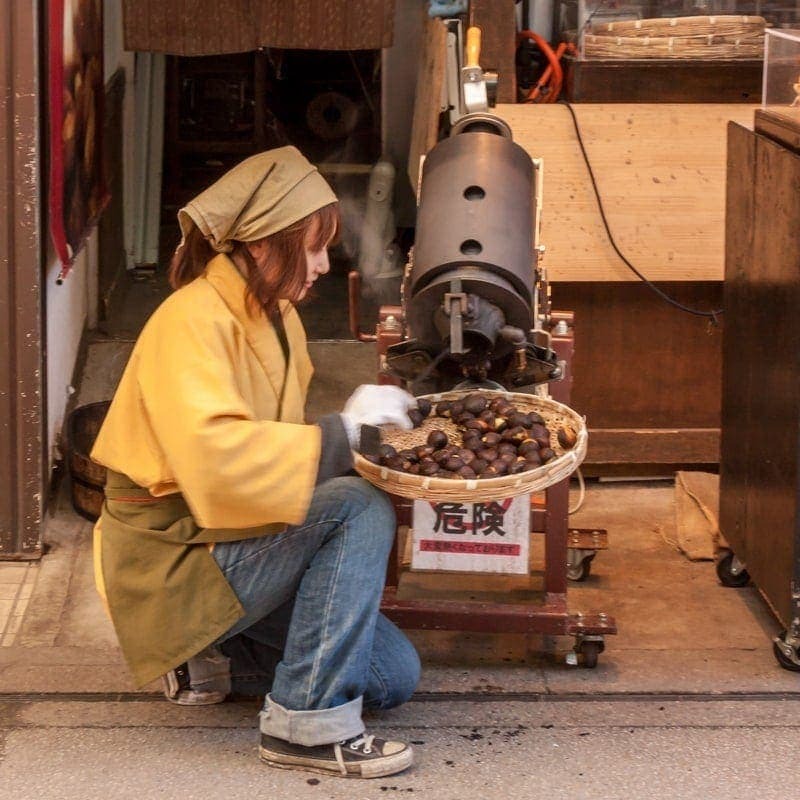 Roasted chestnuts are a seasonal snack and are especially good when you spot someone with a pressure cooker like this for preparing them, they really are at their best freshly cooked. The texture and flavour makes them a filling and delicious treat, to me it’s somewhat similar to oca, the New Zealand yam. We love these for a hiking snack and you can often find roasters near popular walking tails such as Mt Misen on Miyajima Island and Minoo Park and falls in Osaka. Hokkaido is the most northern of Japans main islands and one of the things it’s known for is it’s rich and delicious dairy. Hokkaido produces around half of Japans milk, 90% of its natural cheese and some excellent quality ice creams and yogurts. I don’t eat a lot of dairy, with Crohns it’s really not my friend but as a foodie some times I just can’t resist and have to make an exception. Hokkaido will always be an exception. 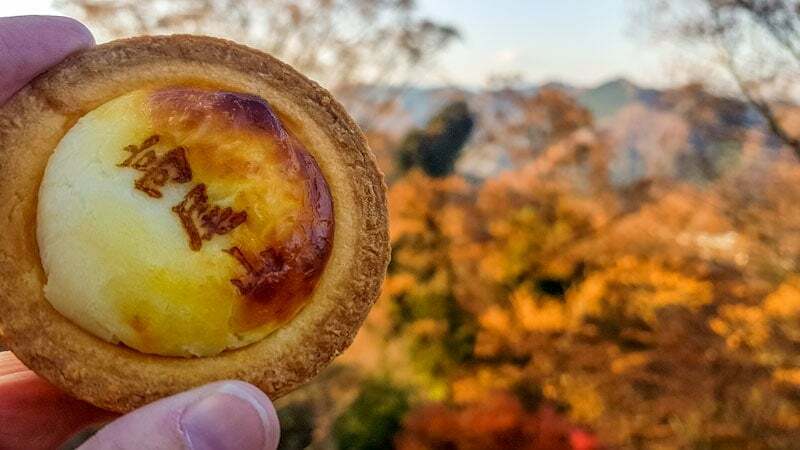 The Hokkaido cheese tarts really are amazing and I did eat a few on my journeys north, fortunately they are also portioned in appropriate serving sizes if you can restrict yourself to just one. You can also now get them all around Japan and the world, this one above was an end of day reward for all the walking we did on Mount Takao in Tokyo. If you don’t speak Japanese you won’t have problems getting by eating out in Japan even though English isn’t widely spoken in the food and hospitality industry. What you will find to help you is that many restaurants will offer you an English menu, a picture menu or a display window with replicas of the dishes on offer. 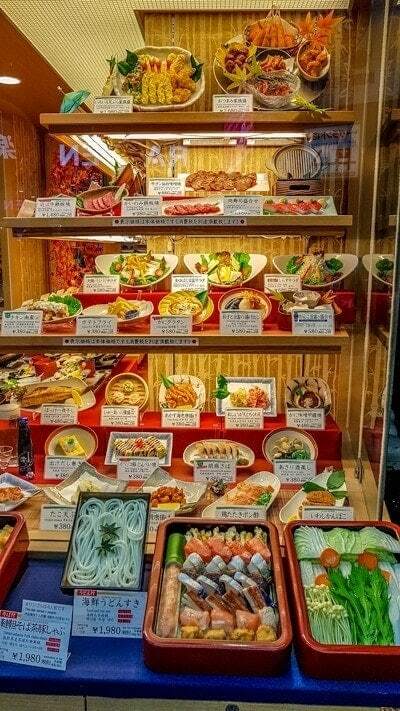 These display windows are usually outside the store and the plastic food displays look incredibly realistic, always sufficient to identify what the dish is. We find this really helpful in choosing where to go if we haven’t already selected somewhere, you can just wander through the street and decide what you fancy by what you see. With these tools it makes ordering easy. 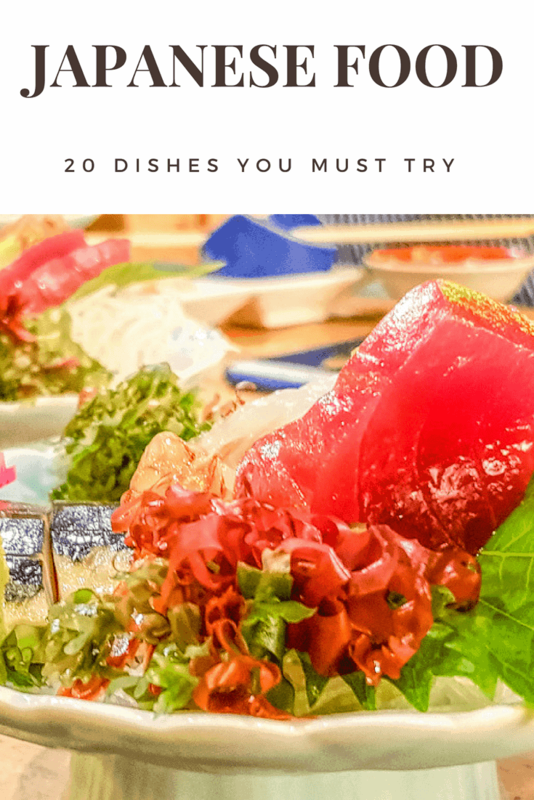 Simply point out the dish you want and say “kore wo kudasai” which basically means “I’d like this, please”, it’s a very handy phrase when travelling in Japan. If there’s a display window outside someone recently suggested to me snapping a photo of what you want and using that when ordering. In Japan you may already be aware that cash is king. While credit cards are becoming more widely accepted, especially in Tokyo in the lead up to the Olympic games you will still find many places especially casual restaurants, traditional places and out of the main cities may not accept credit card so make sure you ask when you book or have cash on hand. Tipping is not expected or part of the culture in Japan, you may even offend someone by leaving a tip. Customer service is excellent but you will find that you tend to only see your waiter when you are first seated, when you order and when you attract their attention. They won’t keep bothering you to ask how your meal is every time your mouth is full. Most of all enjoy eating in Japan with all it’s nuances and unique opportunities. We’ve found many dishes over the years that we were slightly dubious about initially but thoroughly enjoyed and have gone on to order many times. There are so many more dishes we could include here and will no doubt continue to add to it when others come to mind but we’ve tried to include something here for most preferences and family members of all ages. Please add your own suggestions and favourites for first time visitors in the comments below. Thank you for all this delicious info! I leave for Japan tomorrow and I couldn’t be more excited or now…hungry! Have a fantastic trip, Keren! If you have a chance, stay in a Buddhist monastery – especially any in Koyasan. Participate in all their ceremonies and try their cuisine – it is really worth doing so. We did it in July and it was a great experience. You can also try their Goma Dofu – something unique. Enjoy your trip! 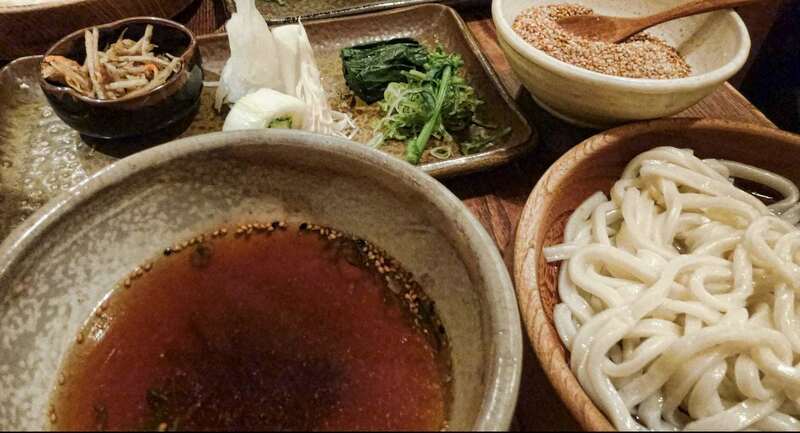 I loved it when you mentioned the udon noodles and how they are perfect for any kind of weather as they can be served hot in the winter and cold in summer. This is actually the first time that I heard noodles being eaten cold. Anyway, I am not planning to travel to Japan anytime soon, but I would like to give Japanese food a taste. Perhaps, I can find one nearby and maybe I can ask them to serve me cold udon. Chagayu (aka tea porridge) is a Western Japanese dish. As the name implies, it is rice cooked in green tea instead of water and served with traditional pickled vegetables. Initially, the monks at Nara’s Todai-ji temple ate chagayu as part of the Omizutori festival, but eventually, it became a common meal consumed throughout the region. While in Nara, it is something not to miss to taste and enjoy. Yum! Yes I’ve had this a couple of times and also made a simple version at home, it’s delicious. Good choice!